Top 20 of 2011: The Wonder Years – Suburbia, I’ve given you all and now I’m nothing – Garage Dusty Exciting Car Team! Following up a great album is always difficult. Following up an album that was almost immediately proclaimed one of the best pop punk records ever made, hit countless 2010 Top 10 lists and changed thousands of lives, as The Upsides did, is near impossible. 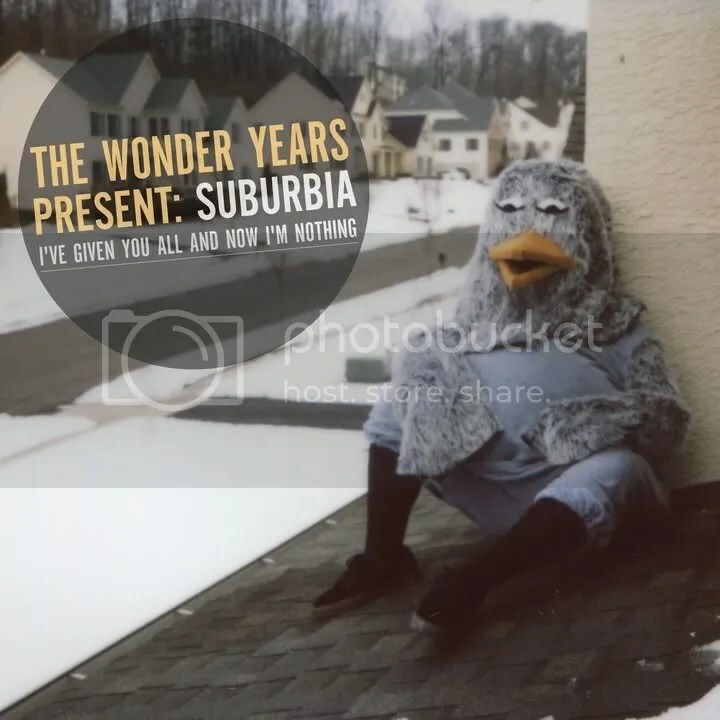 But with Suburbia, I’ve Given You All And Now I’m Nothing, The Wonder Years have taken everything that made The Upsides great, added 12 months of experience and a dash of literary ambition, and turned out something that may be even better. Referencing Allen Ginsberg’s 1956 poem America in its title, concept and story arc, it is immediately apparent that Suburbia is not your average pop punk record. Suburbia loosely documents a year in the life of frontman Dan “Soupy” Campbell, but is also an ode to home. It begins after the release of The Upsides, with Campbell singing “I came out swinging from a South Philly basement/caked in stale beer and sweat, under half lit fluorescents/and I spent the Winter writing songs about getting better, and if I’m being honest, I’m getting there” on opener Came Out Swinging. It touches on the breakup with his ex-girlfriend in Woke Up Older and lead single Local Man Ruins Everything, then moves through a complex song cycle that deals with his love/hate relationship with Lansdale, PA and the suburbs in general. Themes of homesickness, friendship, isolation, loss and hopelessness weave through the record, but always with the thread of hope and positivity that so defined The Upsides. It’s a nuanced story that continually references real life events as well as The Upsides and America. In a way it’s even cinematic – the songwriting teamed with the album artwork creates a sense of place and conjures up strong mental images, while the references to people and events from The Upsides draw the long-term Wonder Years fan into the story. To someone who took The Upsides to heart, these references feel like references to one’s own past which just serves to make the record feel even more personal. The songs themselves are uptempo, expertly played pop punk jams with huge choruses and the occasional left turn to keep things interesting. It’s clear that a year on the road, playing shows every other night, has helped the band hone its craft. Campbell’s singing is the most notable improvement, as he slips from a shout to a croon in many places adding a touch of tenderness and enhancing even further the sense of connection with the listener. The production by Steve Evetts emphasises these vocal qualities, with almost no electronic tweaks being added to the vocals. This gives the vocal delivery a direct, honest feel that is perfectly in sync with the lyrics. In a way, the mark of a great record is that as soon as you listen to it, no one else’s opinion of it matters. That’s how it is with Suburbia. From the first listen, this is a record that takes on an internal life of its own. Everyone will find their own song, or their own line, that speaks as if it was written for them. The pre-release press for Suburbia was that it was less relatable than The Upsides, but the fact remains that it is written and performed in such an everyman style that it is impossible not to find yourself in these songs. It is a record that kids everywhere will attach themselves to, identify with, and cherish for years. It is a record that will endure. If The Upsides announced The Wonder Years as the best thing to happen to pop punk in a decade, Suburbia cements their position at the very top of their genre.